American sculptor, known worldwide for their mobiles, born in Lawton, Pennsylvania, on July 22, 1898; the son of a sculptor and a painter. His studies are oriented towards engineering, the Institute of technology of Hoboken, N.j., made between 1915 and 1919. After graduation, he/she enrolled at the Arts Students League of New York, and studied with John Sloan, until 1926. His first works are as a free-lance commercial artist; in 1927 he/she made mobile toys for the Gould Manufacturing Company and began painting animals for the zoo and circus Barnum & Bailey, one of the issues that always fascinated; the following year he/she moved to Paris where it makes mobile animals in wood and wire for a circus in miniature figures. This ingenious and fun work became very popular among the Parisian avant-garde. His first solo exhibition takes place in Paris in Billiet Gallery in 1929, featuring sculptures of wire and wood. During the following years, continues to make light sculptures of wire, reminiscent of the drawings of Paul Klee, as for example Romulus and Remus of 1928. In 1930 he/she met Piet Mondrian and you atre the work of constructivist, especially Gabo; He/She then began to experiment with abstract and kinetic sculptures. His interest in abstract art was fueled by his friendship with Joan Miró and by its relationship with the abstraction-creation group, which joined in 1931. His first motorized sculpture was exhibited in 1932, and was called mobile at the suggestion of Marcel Duchamp; Jean Arp suggested the stable name for static works of Calder. 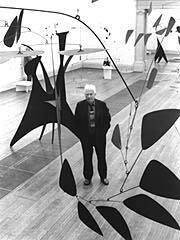 From this exhibition, Calder began to create Mobile powered by the action of the wind, which will be since his favourites, as they relate to his fascination for physics and scientific models. These mobile consist of flat discs of metal, suspended from the ceiling or attached to an arm that holds them to the ground, mounted in equilibrium, so only a slight breeze is needed to operate them, then creating always changing and different forms (the spiral of 1958). Described by Calder as drawings in four dimensions and works inspired by his desire to make mobile Mondrians, as he/she put it in a letter addressed to Marcel Duchamp in 1932. ...Accept the matter as the industry gives it: plates, profiles, and metal bars, and when you want to color, use synthetic enamels currents. Treats these materials with a clever technique, but elementary. It does not attempt to solve complicated problems of geometry as Pevsner, or communicate to mankind important messages, such as Moore. Sports manufacturing mills that are only intended to have fun... (Argan). In 1932 he/she exhibited his mobile in the Julien Levy of New York gallery and moved to America, living in New York and Roxbury, Connecticut. He/She was the only American artist included in the exhibition Cubism and abstract art at the Museum of modern art in New York, which was of crucial importance for the New York art. In 1943 his major retrospective held at the Museum of modern art in New York. During the 1930s it makes decorations for the Martha Graham ballet and other companies. The forms are then biomorphic, in the style of Miró. In his maturity, his refined language, can be defined as a synthesis of abstract surrealism and Constructivism. During the years sixties and seventies realizes stable large scale, monumental; usually of steel painted in red and white, who helped revitalize the idea of sculpture as a spectacle and the assignments for open and public spaces. These parts include Man, 1967, in Montreal, from 24 meters in height, and Flamingo, 1974, for the Chicago Federal Center Plaza. In 1964, he/she had a retrospective at the Guggenheim in New York, in 1974 at the Museum of contemporary art in Chicago and another one, in 1976, at the Whitney Museum of American Art in New York. He/She died on November 11, 1976, in New York.